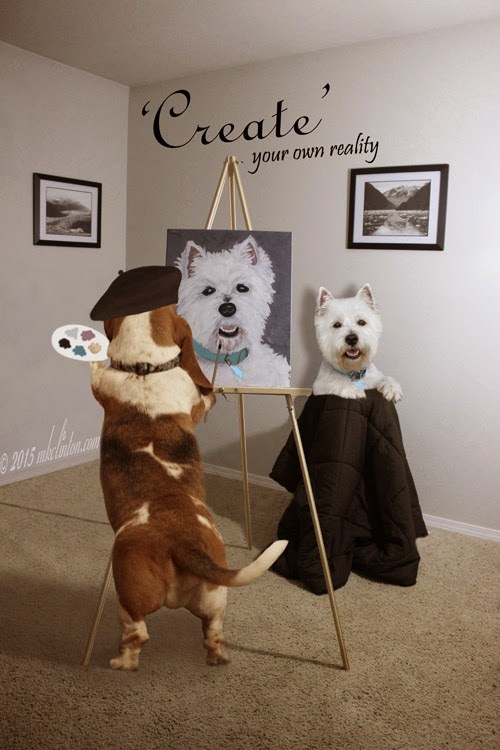 Sometimes you have to ‘Create’ your own reality! We are joining The Lazy Pit Bull for a 52 week photography challenge featuring one word prompts. This week’s word is CREATE. Visit the other blogs below to discover what they CREATE’d. **I’m also joining Sunday’s B & W blog hop co-hosted by Sugar the Golden Retriever and Dachshund Nola. Have a great weekend. Barking from the Bayou Facebook Page! I LOVE THIS!!! Great job on the painting Bentley! I feel like you really captured Pierre's true beauty! Too funny! That is brilliant. Have a super Saturday. Oh man, Bentley...you are on my wavelength! Very nice pawtrait of Pierre. BOL! LOVE this!!! Who knew that Bentley was so talented???? Now that is a great picture, one of my new favorites. You need to come north to the cold to teach me all your tricks. I'm so glad your got a personal page now on FB, good to see you there. You are very talented Bentley! Bentley, we didn't know you were such a talented artist! Very good job for the photo challenge! We are glad that you are using REAL Paints instead of what SARGE used fur HIS Art Pawject today..
You did a grrrrreat job with that Pawtrait. This might be my favorite so far! OMD! So cute! Bentley you will be a famous artist some day! Oh my DOG! That's pawsome! What a terrific and whimsical photo. :) So much fun! Does This Pillow Make Me Look Spoiled?